Call us today at 336-526-7770. 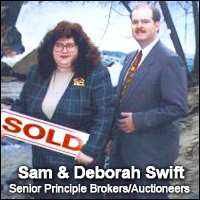 Sam and Deborah Swift have been partners in marriage and business for more than 31 years. They are active members of the North Carolina Association of Realtors®, The National Association of Realtors®, and The North Carolina Auctioneers Association. Swift Real Estate Specialists Inc. represents one of the area's oldest names in real estate, serving clients since 1961 in the Yakin Valley and Blue Ridge Mountains regions - covering Alleghany, Forsyth, Surry, Wilkes, Yadkin and neighboring counties. BID NOW on these open/active properties! 90+ acres. Comfortable brick house with huge sunroom. Dairy buildings and sheds. Rolling crop acres. Cows, horses, livestock are all welcome! Situated at end of quiet dead end road. Approx. 129.99 acres. Homme place cottage with wood water heat. Numerous sheds and out buildings.Great for cattle, horses, livestock or crops. Property sold As Is Where Is. Aprox 18.11 acres and amazing tract with cleared area woodland and Cranberry Creek. Easy commute to Forsyth, Iredell, Wilkes from this pictureqe home site in Yadkin County. Approximately 40 acres, close to I-77. Located off a quiet paved country road almost to the top of a mountain. Enjoy beautiful mountain views with great home site space for gardening, farming, hiking, hunting, trail riding, abundant wild life, room for horses, cows, goats, family style paradise, and two creeks. This cozy family home with 3 bed/1 bath has a living room with knotty pine paneling and accents, den, kitchen with eat-in area, bright sunporch is laundry friendly area. The partial basement is easy access to the mechanicals of the home including furnace and water heater. 21 lots available in neighborhood development conveniently located next to North Wilkes High School. Just off Traphill Rd. on the newly-named North Ridge Drive. Lush green lots with Blue Ridge views. Parcels ideal for doublewides, modular or custom homes. PLUS 8 acre tract of wooded land on Dowell Ridge Road in a rural community full of wildlife with lots of privacy. Nearly 13 acres on 3 tracts of land sold as one. House has 3 bedrooms with 1 full bath. Comfortable kitchen area looks into the breakfast room. Living room with fireplace. Original natural wood siding. Basement included. 8+ acres with a wonderful forest of trees, huge canopies, and lots of privacy. Great location off of US-21 close to medical services and shopping. Within about 30 minutes of Winston-Salem, Statesville, and Wilkesboro. The house on the lot burned down and will need to be removed. Minutes to Elkin High School and Elkin Elementary. Walking distance to Historic Downtown Elkin, the park, recreation center, shopping, medical offices, and hospital. Generous sized and friendly topography, this is the perfect place for building your new home in Elkin! 2.8 acre lot with single-wide home covered in logs. 3 beds, 1 bath, 1,260 square feet. Has partial basement. Property features small barn. old chicken house converted to work shop, out building, shelter where owners made molasses, and garden space and fenced area. Approximately 21 acres bordering both sides of Valley Drive. The zoning is R-12 which can possibly be modified with town and county approval. Ideal opportunity for further development! Approximately 23 acres that includes a great barn, some pastures, and a small creek. Property features a precious restorable 2 or 3 bedroom cottage that is ready to renovate. Site also has space ready for a second modular home with a 2-car garage already in place! Brick house and two lots up for auction for one price! Total acreage is 3.2 acres. 3 bed, 1 bath, 1,560 sq. ft. single family home hash beautiful brick exterior and carport plus fireplace, hardwood floors and replacement windows. 10+ acres situated less than 10 miles from 1-77 & 421. Commercial site with compacted pods able to accommodate multiple tractor trailer terminals. Office facility with private offices plus a shop with 16 ft ceilings and 2 garage doors. 2 Lots off Meshack Ln. This wooded oasis features an open meadow for fun and play. It is a tranquil setting that's private and secluded yet just minutes from everything Elkin has to offer like access to I-77, great shopping, a house of worshship, local wineries, and plenty of trail and hiking systems. Aprox. 63 acre farm track ready for your agro-adventure - to roam, tend, clear and explore. Use as your personal bike trail or ATV playground. Located just minutes from HWY421 in Hamptonville. .81 acres choice lot nestled at the end of the cul du sac in Yadkinville's most beautiful neighborhood. Approximately 25.58 acres up for sale in Surry County off CC Camp Road close to 1-77. Is already a pasture with marketable timber. Also check out the two adjacent properties! Approximately 14.96 acres located off CC Camp Road close to 1-77. Is open flat and has a small tree line. Also check out the two adjacent properties! Approximately 2 acre lot near I-77. Located adjacent to the Motel 6, Jonesville Pitstop/ Citgo Gas Station and Subway Restaurant. House has a finished area of approximately 1,262 sqft. with 3 bedroom and 1 bathroom. Approximately 13.15 acres located off CC Camp Road near 1-77. Already timbered and ready for your special purpose. Also check out the two adjacent properties! At the foot of the Blue Ridge Mountains, there lies a secret cottage tucked under the canopy of the forest. Enjoy a hike or bike ride through almost 20 acres as you explore a gentle stream, rolling hills and scenic valleys of your private mountain home or getaway. Large road frontage tract (approx. 1.3 acres). Great location & investment potential! 1/4 mile to Asbury. 1/2 mile to old HWY 421. 1-77. Minutes to Statesville, the Wilkesboros, and Forsythe County. This is a zoned highway business with county water and sewer nearby. Large road frontage tract (approx. 2.6 acres) in growing Hamptonville area. 1/4 mile to Asbury. 1/2 mile to old HWY 421. 1-77. Minutes to Statesville, the Wilkesboros, and Forsythe County. This is a zoned highway business with county water and sewer nearby. Two 38.73 acre tracts as surveyed. Large road frontage tract on Wagoner Rd. and additional road frontage on Rock House Mountain Rd. True prize for the successful Bidder. Lush green fields and wooded land. Sweeping views and a great location! The story behind Swift Real Estate Specialists, Inc.
For more than 60 years, our family has been caring for people as they make the decision of a lifetime and delivering the highest level of service in the industry. Learn more about the story of how Deborah and Sam Swift first met after which they told friends and relatives that they had found "the one" and intended to marry each other. The perfect location for all your special occasions! We are located in the heart of the North Carolina wine country. Plus learn the special history of Jeepers the Kangaroo. Read the full story of our beloved pet cow who was a mainstay around the Swift farm. Enjoy a memorial slideshow tribute to this wonderful animal who brought a great deal of love into the lives of those who knew her.